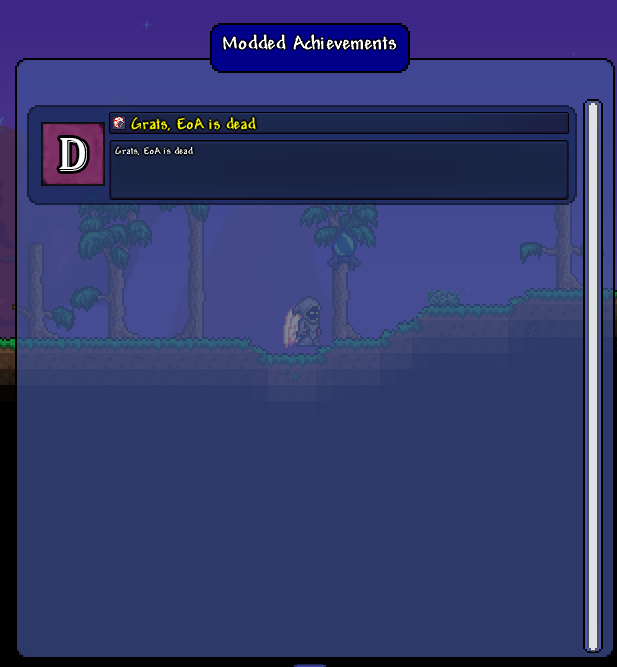 tModLoader Achievements Libs - A mod that allow you to add custom achievement! Discussion in 'Works-in-Progress' started by Dradonhunter11, Jul 24, 2018. 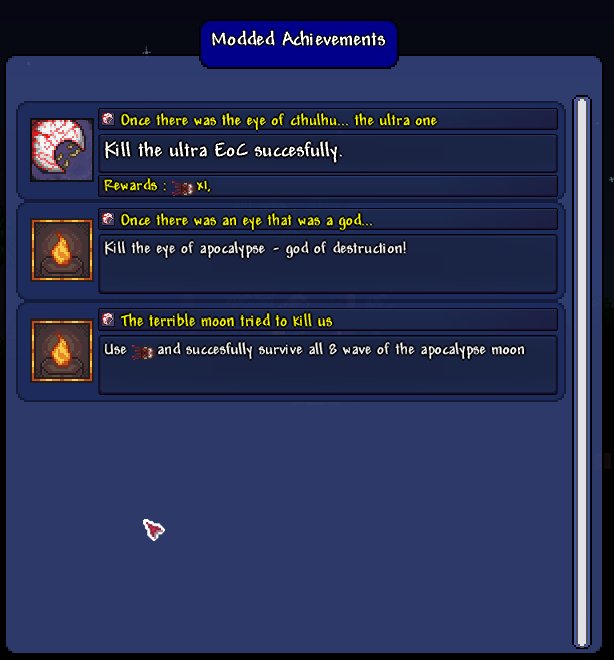 I've been working for quite a while on a new mod that allow you to add new achievement to the game without breaking current system. This mod unlike my previous mod give you the option to use mod call instead of having to extend it directly, but you can also reference them if it's easier for you. Achievement libs is your newest and favorite modded achievement manager, it allow you to make modded achivement basically. But those achievement are not like other achievement, you can actually give reward to the player with them. It can be an item, a list of item, death trap or even world gen stuff! The possibility are unlimited! blushiemagic, jopojelly and the rest of tmodloader team for creating tmod and being awesome! RE-Logic for making this awesome game! SkeletalDestroyr, Linx145, Nova Dee and 8 others like this. Cool! I was actually thinking of adding custom achievements to my mod once I start making it (if TModLoader ever gets patched for the Mac/Gog version), and I think this will help a lot! Nice mod! Yeah, last time I recall they don't have any plan to support GoG, tough they do support the steam mac version of it. KBitegp and Huzbubber Tim like this. Could you clarify the Mod.Call parameters a bit more? What is the mod's internal name? Oh yeah, mod internal name is AchievementLibs for the call. I just remember I forgot to actually update the thread as there is another call implemented in the mod, wich allow to give reward. Rn there is only 2 missing feature that are needed, aka back button and the mod filter. Hey, just wondering, is this mod still being continued? It's been a while since the last update and I'm just wondering if it's still being worked on or not. Yeah, still have couple thing to fix, need to test MP too. I've been focusing on dimension a lot recently.